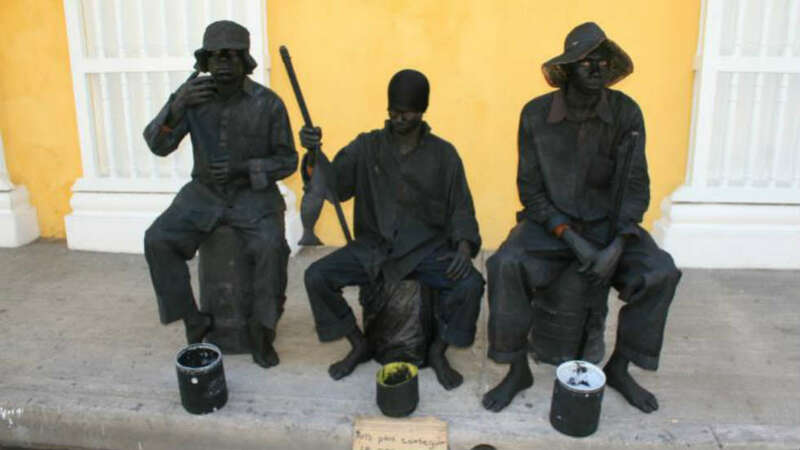 Street artists who disguise themselves as human statues say they have been banned from the historic center of Colombia’s tourist hotspot Cartagena after a robbery, reported newspaper El Universal on Tuesday. The clamp down on the street performers by authorities resulted from an incident two months ago when three tourists had personal items stolen while having a photograph taken with human statues disguised as fishermen. A number of these street performers have subsequently contacted the founder of the MIT organization which represents street artists in Cartagena complaining that they now have no means of making a living. “The complaints I have received from several ‘human statues’ are that they are not letting them work because the Police and Public Space have blocked them. To try to manage this situation we have met Berta Arnedo, director of the Institute of Heritage and Culture of Cartagena (IPCC) to help us identify ourselves, that each of the artists carry their documents and thus have a space to exhibit their art in the Center,” said Charles Beltran. Fernando Niño Mendoza, Secretary of the Interior of Cartagena moved to defend city authorities claiming that street artists have never been stopped working but emphasized that they must comply with certain requirements. “At no time has entry been denied to street artists. What we are asking is that they comply with what is established in the police code and that in order to work they have the certificate of legitimate trust granted to them by the management of public space,” said Mendoza. Local Eder Luis Barrios, who has been working as a human statue for 12 years, told Caracol Radio that the situation is critical for the estimated eight people who earn a living from this work. “We all live nearby, in Loma Fresca. We are from a marginalized neighborhood and beaten down by violence and gangs. We saw in this a refuge, a way of making a living honestly, “he said. Mendoza meanwhile confirmed that police are still searching for one of the “human statues” that was involved in the initial robbery a month ago but the other that was captured is complying with justice. The stolen items have been recovered.